Stella Layton, Assay Master and CEO of Assay Office Birmingham, has been named a Business. World-class AnchorCert Gem Lab, part of Assay Office Birmingham (AOB) and the prestigious London Diamond. “Striking and original” is how the Art Gallery of South Australia has summed up their. Assay Office Birmingham is pleased by national standard body’s announcement to remove the ambiguous ‘no. Since it was launched in September 2014 Domino’s ‘Scintillating Diamonds’ collection of mix-and-match pendant and. Weston Beamor’s focus at this year’s International Jewellery London will be firmly on bespoke design. Domino has announced the launch of a brand new website which, in addition to showcasing. The technical director of Assay Office Birmingham’s AnchorCert Analytical Laboratory has been sharing the organisation’s. Jessica Mead, design assistant at Harriet Kelsall Jewellery has won the BJA Fairtrade ‘I Do’. The annual Weston Beamor Award at New Designers, the national showcase for the ‘best of. A spectacular night for iconic Welsh gold jewellery brand as they walk away with not. Birmingham Jewellery Quarter firm Hockley Mint won big at the recent UK Jewellery Award, scooping. Patrick Fuller’s dream fulfilled Patrick Fuller, Chairman of WB The Creative Jewellery Group who was. The Birmingham casting house and 3D printing specialist Weston Beamor has recently revealed a collection. Domino has just published a brand new 86 page, full-colour, catalogue to accompany its latest. Ancient treasures that form part of the world-famous Staffordshire Hoard collection have been used as. WB the Creative Jewellery Group has announced that all three of its companies – Domino,. Betts Metal Sales are please to introduce their fantastic NEW website. Launched on 20th May. AnchorCert Gem Lab is pleased to announce the launch of its brand new website: www.anchorcertgemlab.com. The. The British Jewellers’ Association has combined forces with The Fairtrade Foundation, Hockley Mint and Clark. The BJA is running a diamond jewellery design competition to celebrate the 60th Anniversary Edition. 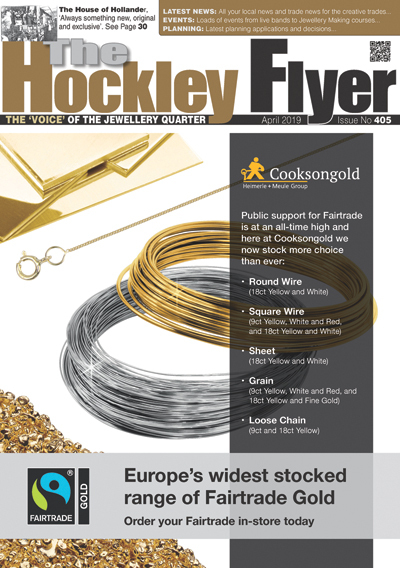 The British Jewellers’ Association has recently launched a survey amongst its membership to gauge the. By Amanda Stücklin The forthcoming Spring Decorative Antiques and Textiles Fair in Battersea Park, which. (Editors Comment: Having noted this item on twitter we asked Diamond Heaven if we could. On 17th and 18th April 2015, London’s Goldsmiths’ Hall will host the UK’s biggest careers. Joanna Fronczak-Jabbal, a CAD Designer at the Birmingham casting house and 3D printing company, Weston. 2015 will see the 30th anniversary of the founding of Mastermelt Ltd. During this period. Weston Beamor, the Birmingham-based jewellery casting and 3D printing company, has announced that it will. Presman Mastermelt have produced an infographic about precious metal recovery from around the workshop,. Cufflinks manufacturers Deakin & Francis have reported a successful show at Jewellery & Watch Birmingham,.